This article explores the three types of popular floats that appear in Japanese festivals. Uniforms are worn by the teams carrying the floats. These uniforms include a happi coat, fundoshi, and jikataba shoes. The top of this portable float is made up of five traditional Japanese bedding (futons). These futons are piled on top of one another and are decorated using ropes, tassels and other decorations. A few persons ride on top of the futons, and a few persons ride below the futons, during the procession. Futon Daiko floats are generally equipped with a taiko-drum and bell. Children are normally recruited to play the drum and ring the bell from within the float. Futon Daiko floats tend to be four meters in height and approximately 2 to 3 tons in weight. The float is supported by a wooden frame, bamboo handles, and approximately 70 men. The movements of these floats in crowds represent the movements of a ship in the ocean. This float is a traditional Japanese wooden float with elaborate hand carved designs and decorations. The carvings depict celebrated battles, Japanese motifs, famous figures and records of war in ancient Japan. It is typically made by highly skilled carpenters and sculptors. It is put together by the danjiri team without the use of a single nail. Danjiri floats are designed in the shape of shrines or temples. It is generally around 5m tall. It weighs approximately 3-4 tons, and is pulled by teams of 100 to 500 persons. It is generally pulled at whirlwind speeds, throughout the neighborhood during festivals. Typically there are persons in charge of controlling the float and motivating the team. They are seated on the float, and one stands on top bellowing chants and dancing. They are vital for team synchronization especially during the turning of corners. During competitions, the winning team is determined based on their display of prowess, team dynamics, energy and performance. The one on top of the float is called the Daiku-gata. The Daiku-gata executes unique performances on top of the danjiri, while it’s being pulled. These floats gives locales a change to show their strength, courage, and endurance. It gives locales the opportunity to bond as a team while showing community pride. The sole purpose of this float is to transport a Kami (Shinto god), throughout the community. It is good fortune to have the Kami see the community. This pleases the Kami and purifies the community. This float weighs anywhere between 1-2 tons, carried by teams of 10-30 people. The weight of the mikoshi is to physically challenge the teams. 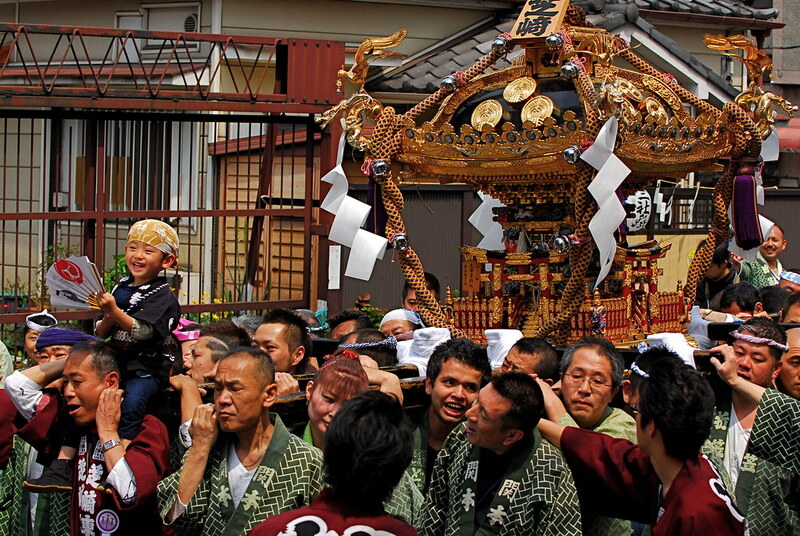 Carrying a mikoshi is seen as a great honor since it houses the Kami. It is also a display of strength and bravery. Depending on the atmosphere of the festival, the mikoshi may be vigorously bounced up and down. This is common during lively grand festivals. During some mikoshi festivals held near rivers, oceans or lakes; the mikoshi float is dipped into the water (ohamaori).